Through the 1990’s, Rosemary Mvumvu worked at a light-bulb factory in a nearby suburb until one day she suddenly was faced with a personal tragedy. While lying in a hospital bed and contemplating the future of her family, she had a vision that showed that her life could have more meaning. 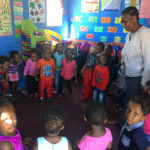 She was inspired to look after the children of her community. Neighbors and social workers saw how well she was looking after these children and they started bringing more and more kids to her door. It soon became clear from the growth of her home that she needed to start a proper organization. Many of the children in Rosemary’s care have been physically and sexually abused and have been neglected by their families. Ilitha currently has 12 kids living in the home, although that number changes frequently. Some are there permanently, while others are there for a short period of time. CHOSA began working with Ilitha Labantwana in 2008 and linked Rosemary to a local donor who paid to have a major addition done to the home in 2010. CHOSA has also helped to advocate for appropriate educational placements for children who reside at Ilitha. Our partnership currently focuses on capacity building, financial management, and networking.